Our last full day in Maui was a busy one. We got an early start to hit the hairpin curves of the road to Hana. But first, breakfast at a restaurant in Lahaina that the boys had heard about. Someone had mentioned it when they were on their trip to Haleakala. The restaurant, Longhi's, was, as it turned out, an Italian restaurant located on Front Street in Lahaina. When we arrived, we were seated immediately. There were only a couple of other tables that were occupied, so we pretty much had the place to ourselves. I figured, as an Italian restaurant, Longhi's did the majority of their business at the lunch and dinner hours. Anyway, our server was attentive and friendly and quickly brought a round of freshly squeezed orange juice for most of us and coffee for JD. She also suggested a cinnamon roll, which the boys eagerly agreed to try. It was huge, so they all shared it while we studied our menus. Rob's breakfast included a waffle, two eggs, 2 pieces of bacon and toast. Tyler had lox and bagels served with cream cheese and capers. Scott had scrambled eggs, bacon, hash browns and toast. I had a spinach quiche topped with a tomato slice served with fresh pineapple and toast. So what did we think? Well, Longhi's is in a great location. The service was wonderful. The food was good, but not really special. The problem was the price. For what we got, Longhi's was way overpriced. We realize that Longhi's is in a high priced area, but the breakfast we got wasn't worth $120.00. It was fine. and we ate it, but the quality and the price didn't match up. Honestly, we could have gotten a better meal at Waffle House for much less money. Simply put, when we go back to Maui, we probably will not go back to Longhi's, at least not for breakfast. 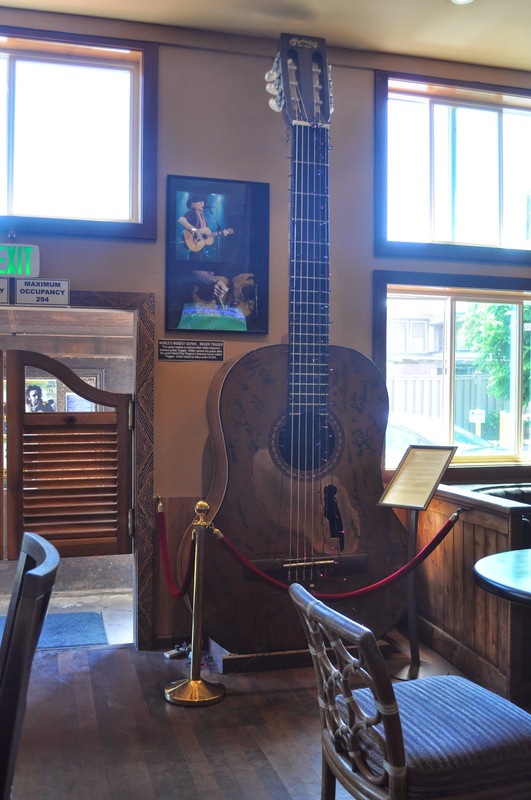 While in Paia, we also took time to check out the favorite haunt of Paia's Red-headed Stranger, Willie Nelson. Charley's Restaurant and Saloon is the country crooner's hang-out of choice when he is in town. Rob and I ran in to Charley's to see if Willie was around. He wasn't, but we interrogated the staff and got the inside scoop. 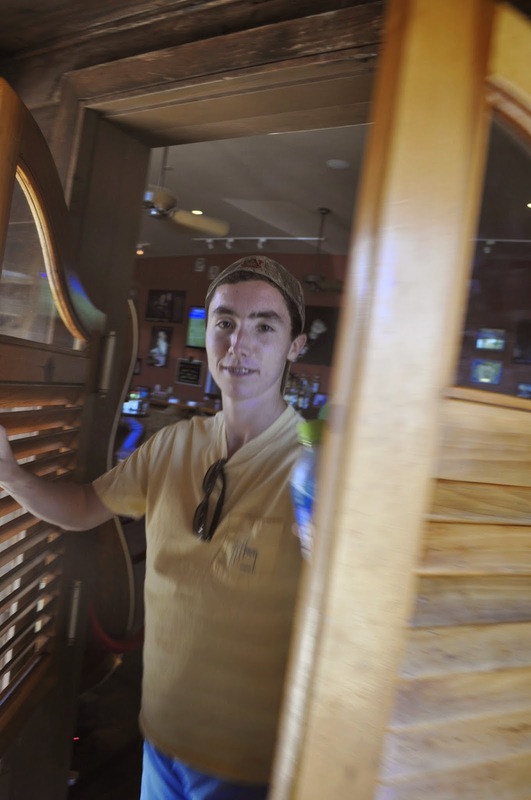 According to Charley's employees, Willie is usually in house about 7-8 times a year and he sometimes entertains the patrons when he stops by. The last time he had been to Charley's was Easter. 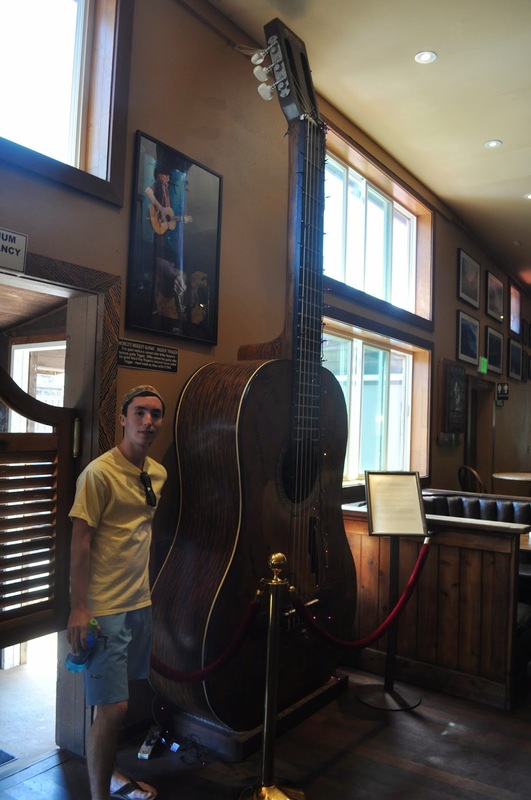 We saw the world's biggest guitar nicknamed, Bigger Trigger, by Willie himself. And Rob practiced his cowboy skills by busting through the saloon's swinging doors. When we had gleaned all the information we could and determined that Willie wasn't hiding in a corner anywhere, we skedaddled back out to the car and headed toward Hana. Our first stop on the road to Hana was this darling little smoothie stand. The boys had fun entertaining the cute girl manning the stand. We ordered some pineapple banana bread which was very tasty, except for the bottom, which had been burned. I also got a smoothie called The Cure, made with coconut, ginger, honey and papaya. It sounded good, but it was vile! If there was any honey in that smoothie, I couldn't tell it. There was nothing sweet about it. There was another stand behind the main one where a girl was pounding sugar cane for the smoothies. I should have gotten her to add some to mine! I wonder if it was called "The Cure" because drinking it would cure you of ever ordering another smoothie in your life! We stopped for a while to check out a beautiful and mysterious looking black sand beach. There was a swimsuit model working a photo shoot while we were here. The boys were quite impressed! The Seven Sacred Pools has to be one of the most beautiful spots on earth! 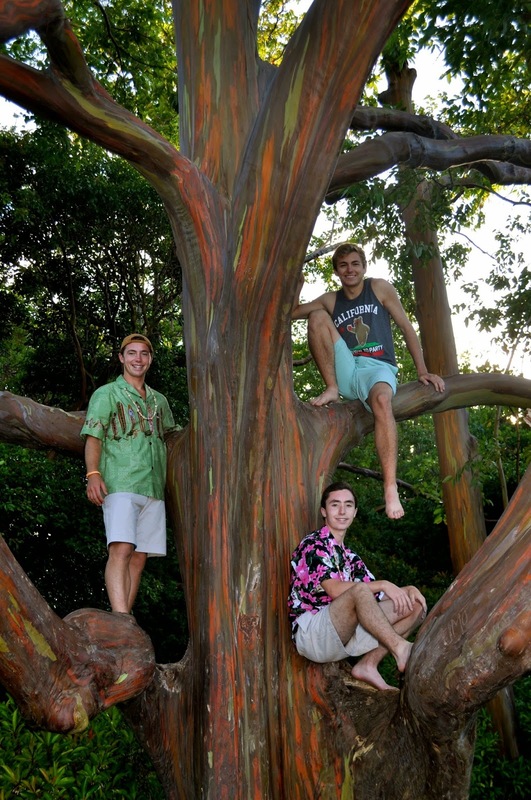 We were especially impressed with a grove of rainbow eucalyptus trees. The bark is amazing! There were coconut trees everywhere on Hana Road! Tyler, whom we nicknamed, Mr. Trivia, told us more people are killed by coconuts than by great white sharks! Turns out, he was right! One of the locals told us that is why you won't see any coconut trees at any of the resorts in Hawaii. They are worried about a coconut falling on someone's head! We ran into Hasegawa's General Store hoping to find shave ice. Sadly, there was no shave ice at Hasegawa's! It was a full day of driving and stopping and driving some more. There were many places we could have stopped that we didn't. By the time we got back to Paia, we had a little bit of time to check out the town before everything closed. This surfboard fence caught my eye. That's something we don't see too often at home. The setting sun was beautiful. We wished we had more time, but we had a plane to catch for the big island the next morning, so we headed back to the hotel to pack up. Mahalo, Maui, for your sweet laid-back hospitality. We had a wonderful time! Three Friends and a Fork gives Longhi's 2 Yums UP. The food is fine, but not special enough to warrant the prices. The service, location and setting are wonderful.